PR Newswire, MENLO PARK, Calif.
Washington, D.C., isn’t the only place brimming with politics. In a new survey by staffing firm Accountemps, 80 percent of professionals said they believe office politics are alive and well in the workplace. Only 14 percent said participating in office politics is not necessary at all to get ahead, compared to 42 percent in a 2012 survey. 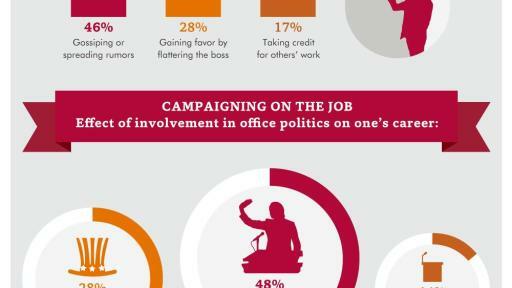 Twenty-eight percent said “politicking” is very necessary for career advancement, up from 15 percent in 2012. More than half of workers (55 percent) said they take part in office politics, with 16 percent describing themselves as “active campaigners” and 39 percent self-identifying as “occasional voters.” Respondents also noted the most common forms of office politics are gossip (46 percent) and gaining favor by flattering the boss (28 percent). Gossip Hound: This person knows everything about everyone and isn’t afraid to share information. She gets a rush by spilling secrets during lunch or posting confidential details on social media. How to deal: Keep conversations with this individual related to business. When you sense the topic is shifting to coworkers’ personal lives, gracefully exit the conversation by saying you have pressing work to attend to. Credit Thief: This colleague wants to get ahead at any cost, even if it means stealing your ideas or passing your work off as his own. How to deal: Be more vocal about your views and projects in front of the whole team. Provide frequent updates to your manager so there is no confusion about where credit is due. Flatterer: It can be hard to tell whether this person’s compliments are genuine or just a ploy to win people over. Take her comments with a grain of salt. How to deal: Fortunately, most managers can see through fakeness, so there’s no need for you to call out this behavior. Saboteur: This person hasn’t gotten the memo that there’s no “I” in team, and works to benefit only himself. He can be openly critical, throws others under the bus and rarely takes responsibility for his faults. How to deal: Be wary of this individual. Sometimes a Saboteur will back down if confronted. If the issue continues, keep track of your interactions and bring it up with your manager or human resources. Lobbyist: Often fighting for what she believes in and known for swaying opinions to her favor, the office Lobbyist could have had a lucrative career in politics. How to deal: When working with a Lobbyist, voice your views on projects and speak up if you disagree with her outlook. Though a Lobbyist can be unreceptive to fresh ideas, a little explanation may be the key to getting her to open up to new concepts. Adviser: Those in leadership positions often turn to this trusted associate who serves as their “eyes and ears” of the company. The Adviser works closely with company leaders and holds indirect power. How to deal: Befriend the Adviser – he is often the gatekeeper of significant information and wields influence behind the scenes. 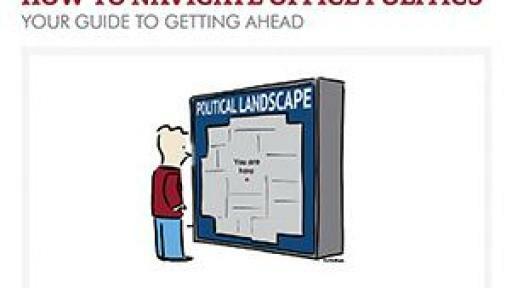 To access North American survey results and additional advice for dealing with politics at work, download How to Navigate Office Politics: Your Guide to Getting Ahead. The survey was developed by Accountemps and conducted by an independent research firm. It includes responses from more than 1,000 U.S. workers 18 years of age or older and employed in office environments. Accountemps, a Robert Half company, is the world’s first and largest specialized staffing service for temporary accounting, finance and bookkeeping professionals. The staffing firm has more than 325 offices worldwide. More resources, including job search services and the company’s blog, can be found at roberthalf.com/accountemps.